Luca BARTOLOZZI's areas of interest are taxonomy and faunistics of the Lucanidae and Brentidae. 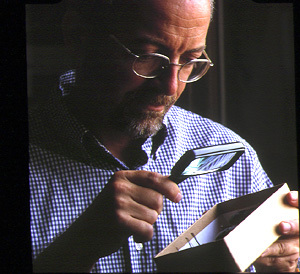 He is Curator in the Entomology Department of the Zoological Museum La Specola at the University of Florence. BARTOLOZZI L. & NAGAI S., 2017. Description of a new species of Dorcus Macleay, 1819 from the Philippines (Coleoptera, Lucanidae). Giornale italiano di Entomologia, 14(62): 827-830. BARTOLOZZI L. & ZILIOLI M., 2016. Remarks on the genus Penichrolucanus Deyrolle, 1863 (Coleoptera: Lucanidae). Onychium, 12: 123-128. MONTE C., ZILIOLI M., BARTOLOZZI L., 2016. Revision of the Australian species of Figulus MacLeay, 1819 (Coleoptera: Lucanidae). Zootaxa 4189(3): 447–484. SOLANO E., THOMAES A., COX K., CARPANETO G. M., Cortellessa S., Baviera C., BARTOLOZZI L., ZILIOLI M., Casiraghi M., AUDISIO P., ANTONINI G., 2016. When morphological identification meets genetic data: the case of Lucanus cervus and L. tetraodon (Coleoptera, Lucanidae). Journal of Zoological Systematics and Evolutionary Research, 54 (3): 197-205. [doi: 10.1111/jzs.12124]. BARTOLOZZI L., 2015. A new species of Penichrolucanus Deyrolle, 1963 (Coleoptera: Lucanidae) from the Philippines. The Coleopterists Bulletin, 69(3): 389-394. CARPANETO G.M., BARTOLOZZI L., BAVIERA C., AUDISIO P., PIATELLA E., CAMPANARO A., BARDIANI M., TINI M., ROMITI F., ANTONINI G., SOLANO E., CORTELLESSA S., 2015. Family Lucanidae (pag. 85). In: Carpaneto G.M., Baviera C., Biscaccianti A.B., Brandmayr P., Mazzei A., Mason F., Battistoni A., Teofili C., Rondinini C., Fattorini S., AUDISIO P. (eds): A Red List of Italian Saproxylic Beetles: taxonomic overview, ecological features and conservation issues (Coleoptera). Fragmenta entomologica, 47(2): 53-126. CECCOLINI F., BARTOLOZZI L., CIANFANELLI S., 2015. Conferma della presenza di Dorcus parallelipipedus (Linnaeus, 1758) nell’isola di Zannone (Isole Ponziane) (Coleoptera: Lucanidae). Onychium, 11: 114-116. ANDREONE F., BARTOLOZZI L., BOANO G., BOERO F., BOLOGNA M.A., BON M., BRESSI N., CAPULA M., CASALE A., CASIRAGHI M., CHIOZZI G., DELFINO M., DORIA G., DURANTE A., FERRARI M., GIPPOLITI S., LANZINGER M., LATELLA L., MALO N., MARANGONI C., MAZZOTTI S., MINELLI A., MUSCIO G., NICOLOSI P., PIEVANI T., RAZZETTI E., SABELLA G., VALLE M., VOMERO V., ZILLI A., 2014. Italian natural history museums on the verge of collapse? Zookeys, 456: 139-146. BARTOLOZZI L., GHAHARI H., SPRECHER-UEBERSAXE., ZILIOLI M., 2014. A checklist of stag beetles (Coleoptera: Scarabaeoidea: Lucanidae) from Iran. Zootaxa, 3887(3): 422-436. CARPANETO G. M., BARTOLOZZI L., Baviera C., AUDISIO P., 2014. Famiglia Lucanidae. Appendice 1 e schede tecniche on line (www.iucn.it). In: AUDISIO P., Baviera C., CARPANETO G. M., Biscaccianti A. B., Battistoni A., Teofili C., Rondinini C. (Eds), Lista Rossa IUCN dei Coleotteri saproxilici Italiani. Comitato Italiano IUCN e Ministero dell’Ambiente e della Tutela del Territorio e del Mare, Roma, 132 pp. CORTELLESSA S., CIAFERONI F., BARTOLOZZI L., 2014. Nuovi dati sulla distribuzione dei Lucanidi in Toscana (Coleoptera, Lucanidae). Onychium, 10 (2013): 68-77. VU V.L., BARTOLOZZI L., ORBACH E., FABIANO F.,CIAFERONI F., MAZZA G., BAMBI S., SBORDONI V., 2014. The entomological expeditions in northern Vietnam organized by the Vietnam National Museum of Nature, Hanoi and the Natural History Museum of the University of Florence (Italy) during the period 2010-2013. Onychium, Supplemento 1: 5-55. COX K., THOMAES A., ANTONINI G., ZILIOLI M., DE GELAS K., HARVEY D., SOLANO E., AUDISIO P., MCKEOWNN., SHAW P., MINETTI R., BARTOLOZZI L., MERGEAY J., 2013. Testing the performance of a fragment of the COI gene to identify western Palaearctic stag beetle species (Coleoptera, Lucanidae). In: Nagy Z.T., Backeljau T., De Meyer M., Jordaens K. (eds). DNA barcoding: a practical tool for fundamental and applied biodiversity research. Zookeys, 365: 105-126. COELHO-GROSSI P. and BARTOLOZZI L. 2011. Description of a new genus and species of stag beetle from the Peruvian Andes (Coleoptera: Lucanidae: Lucaninae). Coleopterists Bulletin 65(4): 387-392. BARTOLOZZI L., CIAFERONI F., and MONTE C. 2011. Checklist of the Lucanidae (Insecta: Coleoptera) from the Indo-Australian transition zone (pp. 43-58, plates 6-8). In: Telnov D. (Ed. ), Biodiversity, Biogeography and Nature Conservation in Wallacea and New Guinea, Vol. 1. Onore G., BARTOLOZZI L., and ZILIOLI M. 2011. A new species of the genus Syndesus Macleay, 1819 (Coleoptera, Lucanidae) from Ecuador. Kogane 12: 43-48. HARVEY, D.J., GANGE, A.C., HAWES, C.J., RINK, M., ABDEHALDENA, M., AL-FULAIJ, N., ASP, T., BALLERIO, A., BARTOLOZZI, L., BRUSTEL, H., CAMMAERTS, R., CARPANETTO, G., CEDERBERG, B., CHOBOT, K., CIAFERONI, F., DRUMONT, A., ELLWANGER, G., FERREIRA, S., GROSSO-SILVA, J., GUEORGUIEV, B., HARVEY, W., HENDRIKS, P., ISTRATE, P., JANSSON, N., JELASKA, L., JENDEK, E., JOVIC, M., KERVYN, T., KRENN, H., KRETSCHMER, K., LEGAKIS, A., LELO, S., MORETTI, M., MERKI, O., MADER, D., PALMA, R., NECULISEANU, Z., RABITSCH, W., RODRIGUEZ, S., SMIT, J., SMITH, M., SPRECHER-UEBERSAX, E., TELNOV, D., THOMAES, A., THOMSEN, P., TYKARSKI, P., VREZEC, A., WERNER, S., and ZACH, P. 2011. Bionomics and distribution of the stag beetle, Lucanus cervus (L) across Europe. Insect Conservation and Diversity 4: 23-38. MONTE C. and BARTOLOZZI L. 2010. Revision of the African Figulus Macleay, 1819 (Coleoptera, Lucanidae). 2: the insular species. Ent. Afr. Collection Hors Série N°4 (2010) 24 pp., 17 figs. CARPANETO G.M., BARTOLOZZI L., Mazzei P., Pimpinelli I., and Viglioglia V., 2010. Aegus chelifer Macleay 1819, an Asian stag beetle (Coleoptera Lucanidae) invading the Seychelles Islands: a threat for endemic saproxylic species? Tropical Zoology 23: 173-180. ONORE G. and BARTOLOZZI L. 2008. Description of the larvae of Sphaenognathus (Chiasognathinus) gaujoni (Oberthür, 1885) and S. (C.) xerophilus Barolozzi & Onore, 2006 (Coleoptera: Lucanidae), with observations about their altitudinal range extension. Biodiversity of South America, I. Memoirs on Biodiversity 1: 399-406, 24 figs. BARTOLOZZI L., BETINELLI S., BOTTACCI A., CIAFERONI F., FABIANO F., MAZZA G., ROCCHI S., TERZANI F., ZINETTI F., and ZOCCOLA, A. 2008. Ceruchus chrysomelinus (Hochenwatch, 1785), interessante ritrovamento nella Riserva Naturale Integrale di Sasso Fratino (Forlì-Cesena) (Insecta Coleoptera Lucanidae). Quad. Studi Nat. Romagna 27: 135-142, 6 figs. WAN X., BARTOLOZZI L., and Yang X. 2007. Taxonomic notes on some Chinese species of Neolucanus Thomson and Prismognathus Motschulsky (Coleoptera: Lucanidae). Zootaxa 1510: 51-56, 25 figs. BARTOLOZZI L. and MAGGINI L., 2007. Insecta Coleoptera Lucanidae. In: Ruffo S. and Stoch F. (eds. ), Checklist and distribution of the Italian fauna. Memorie del Museo Civico di Storia Naturale di Verona, 2.serie, Sezione Scienze della Vita 17 : 191-192, with data on CD ROM. BARTOLOZZI L. and SPRECHER-UEBERSAXE. 2006. Lucanidae (pp. 63-77). In: Löbl I. and Smetana A. (Eds), Catalogue of Palaearctic Coleoptera. Vol. 3. Scarabaeoidea – Scirtoidea – Dascilloidea-Buprestoidea – Byrrhoidea. Apollo Books, Stenstrup, 690 pp. BARTOLOZZI L. & ONORE G., 2006. Sphaenognathus (Chiasognathinus) xerophilus sp. n. from Peru (Coleoptera: Lucanidae). Koleopt. Rundschau, 76: 361-365. BARTOLOZZI L. & WAN X., 2006. A new species of Prismognathus Motschulsky from Xizang (Tibet), China (Coleoptera: Scarabaeoidea: Lucanidae). Zootaxa, 1129: 61-68. IMURA Y. & BARTOLOZZI L., 2006. A new subspecies of Platycerus hongwonpyoi (Coleoptera, Lucanidae) from Nei Mongol Zizhiqu of North China. Elytra, 34(1): 135-137. BARTOLOZZI L., 2005a. Recensioni: E. Sprecher & G. Taroni, Lucanus cervus depictus. Boll. Soc. ent. ital., 137(2): 146-147. BARTOLOZZI L., 2005b. Description of two new stag beetle species from South Africa (Coleoptera: Lucanidae). African Entomology, 13(2): 347-352. BARTOLOZZI L. & MAGGINI L., 2005. Insecta Coleoptera Lucanidae (pp. 191-192). In: Ruffo S., Stoch F. (eds), Checklist e distribuzione della fauna italiana. Mem. Mus. civ. St. nat. Verona, 2. serie, Sez. Scienze della Vita, 16, 307 pp. + CD-Rom. BARTOLOZZI L. & MONTE C., 2005. Review of Figulus sublaevis (Palisot de Beauvois, 1805) and F. anthracinus Klug, 1833 (Coleoptera: Lucanidae). Koleopt. Rundschau, 75: 337-348. BARTOLOZZI L. & SFORZI A., 2005. Insetti (pp. 80-89). In: Castelli C. & Sposimo P. (Eds). La biodiversità in Toscana. Specie e Habitat in pericolo. Rassegna delle conoscenze sullo stato della biodiversità in Toscana. Regione Toscana, Direzione Generale Politiche Territoriali e Ambientali, CD-Rom, 210 pp. MONTE C. & BARTOLOZZI L., 2005. Revision of the continental African species of Figulus Macleay, 1819, with description of Figulus pseudominor n. sp. (Coleoptera, Lucanidae). Entomologia Africana, Hors Série, 2: 1- 24. BARTOLOZZI L. & WERNER K., 2004. Illustrated catalogue of the Lucanidae from Africa and Madagascar. Taita Publ., Hradec Kralove, Czech Rep., 192 pp. BARTOLOZZI L., 2003a. A new species of Prismognathus Motschulsky from Yunnan, China (Coleoptera, Lucanidae). Animma.x, 2: 17-21. BARTOLOZZI L., 2003b. Contribution to the knowledge of the Tasmanian lucanids, with a description of two new species of Lissotes Westwood, 1855 (Coleoptera: Lucanidae). Monogr. Mus. reg. Sci. nat. Torino, 35: 329-342. Naturale dell'Università di Firenze - Sezione di Zoologia La Specola. XXI. Insecta Coleoptera: tipi. Addenda (1985-2001) e corrigenda. Atti della Soc. tosc. Sci. nat., Mem. (B), 108 : 77-107.
of the Lucanidae from Nepal (Insecta, Coleoptera). Entomol. Basiliensia, 24: 289-304. BARTOLOZZI L. & SFORZI A., 2001. Lucanidae (pp. 167-172, 5 fig.). In: SFORZI A. & BARTOLOZZI L. (Eds). Libro Rosso degli insetti della Toscana. ARSIA, Regione Toscana, Firenze, 375 pp. ARAYA K., TANAKA M., BARTOLOZZI L., 1998. Taxonomic review of the genus Aesalus Coleoptera: Lucanidae) in the Himalayas. Eur. J. Entomol., 95: 407-416. BARTOLOZZI L. & SFORZI A., 1998. Description of Odontolabis kirchneri new species of stag beetle from Sumatra (Coleoptera, Lucanidae). Facetta, 16(2): 2-6. BARTOLOZZI L., SFORZI A., TARONI G., ZUFFI S., 1998. Testi in catalogo. In: Taroni G. (Ed). Il Cervo Volante (Coleoptera Lucanidae). Electa, Milano, 182 pp. ARAYA K., KON M., BARTOLOZZI L., BOMANS H. G., REYES-CASTILLO P., 1996 Phylogeny of the tribe Aesalini (Coleoptera, Lucanidae). A celebration of systematics. 15th meeting of the Willi Hennig Society. University of Cape Town, South Africa: 11 pp. ARAYA K., Kon M., BARTOLOZZI L. 1997. Morphological comparisons of the Old World Aesalini (Insecta, Coleoptera, Lucanidae), with special reference to Aesalus imanishii from Taiwan. The Symposium on the Phylogeny, Biogeography and Conservation of Fauna and Flora of East Asian Region, Taiwan: 125-133. SFORZI A. & BARTOLOZZI L. 1997. Revision of the species of the genus Ceocephalus Guerin-Meneville  (Coleoptera Brentidae) with 9-articulated antennae. Tropical Zoology, 10(1): 173-189. BARTOLOZZI L. & SFORZI A. 1997. Contribution to the knowledge of the Brentidae from Gabon (Coleoptera Brentidae). Boll. Soc. entom. ital., 129(1): 79-86. BOMANS H.E. & BARTOLOZZI L. 1996. Description of Microlucanus greensladeae n. gen. n. sp. (Coleoptera Lucanidae) from the Solomon Islands and check-list of the stag beetle fauna of Bougainville and the Solomon Islands. Tropical Zoology, 9: 213-222. BARTOLOZZI L. 1996. On some Stag Beetles from Irian Jaya (Indonesia), with description of Aegus riedeli n. sp. and new syonymy of A. frater Arrow 1935 with A. platyodon Parry 1935 (Coleoptera, Lucanidae). Coleopteres, 2(12): 127-133. BARTOLOZZI L. 1996. Description of a new species of Hoplogonus Parry, 1875 from Tasmania (Coleoptera, Lucanidae). Redia, 79(1): 91-95. BARTOLOZZI L. 1996. A new species of Hoplogonus Parry, 1875 (Coleoptera, Lucanidae). Mitt. Schw. Ent. Ges., 69: 483-487. ORBACH E., BARTOLOZZI L. & SFORZI A. 1995. A new afrotropical species of Rhinopteryx Lacordaire (Coleoptera: Brentidae). Coleopt. Bull., 49(1): 17-22. BARTOLOZZI L. 1995. Recensione di: Ricerche Biologiche in Sierra Leone (parte IV). Accademia Naz. dei Lincei, Problemi attuali di scienza e di cultura. Sezione: Missioni ed Esplorazioni. XIII, Quaderno 267. Tropical Zoology, 8: 435. BARTOLOZZI L. 1995. Description of a new species of Colophon from South Africa (Coleoptera, Lucanidae). Fragmenta Entomologica, 26(2): 333-340. IMURA Y. & BARTOLOZZI L. 1994. Descriptions of two new species of Platycerus (Coleoptera, Lucanidae) from Central Sichuan, Central China. Elytra, Tokyo, 22(1): 139-143. BARTOLOZZI L. & SFORZI A. 1994. Contribution to the knowledge of the Lucanidae from the Himalayan Region (Insecta, Coleoptera). Nouv. Revue Ent. (N.S. ), 11(2): 107-116. BARTOLOZZI L. & SFORZI A. 1994. Contribution to the knowledge on Brentidae from Kenya. Koleopt. Rundschau., 64: 249-256. BARTOLOZZI L., Onore G. & BOMANS H.E. 1994. Descrizione delle femmine di Sphaenognathus metallescens De Lisle e di Sphaenognathus subtilis Lacroix (Coleoptera, Lucanidae). Frustula entomol., 16 (1993): 165-173. BARTOLOZZI L. 1994. Segnalazioni faunistiche italiane, 259. Boll. Soc. ent. ital., 126: 79. SFORZI A. & BARTOLOZZI L. 1993. A new species of Stratiorrhina Pascoe from Malaysia and Borneo and description of the female of Eterodiurus singularis Senna (Coleoptera: Brentidae). Coleopt. Bull. 47(3): 293-300. SAMA G. & BARTOLOZZI L. 1993. Contributo alla conoscenza dell'entomofauna del Parco Naturale della Maremma. III. Coleoptera Cerambycidae. Redia, 76(1): 17-37. NISTRI A., VANNI S., BARTOLOZZI L. & Bambi S. 1993. Contributo alla conoscenza dell'entomofauna del Parco Naturale della Maremma. II. Coleoptera Scarabaeidae (Scarabaeinae e Coprinae) e Geotrupidae. Boll. Mus. Civ. St. Nat. Grosseto, 14 (1991): 5-13. MAGNANI G., BARTOLOZZI L.& Bambi S. 1993. Contributo alla conoscenza della entomofauna del Parco Naturale della Maremma. I. Coleoptera Buprestidae. Redia, 75 (2)(1992): 429-446. BOMANS H. E.& BARTOLOZZI L., 1993. Description d'une nouvelle espèce d' Aegus Macleay des Îles Philippines (Coleoptera, Lucanidae). Lambillionea, 93(1): 123-125. Sphaenognathus oberon Kriesche (Coleoptera: Lucanidae). Coleopt. Bull., 47(2): 126-128. BARTOLOZZI L. 1993. Recensione di: Zunino M., Belles X. & Blas M. (Eds). 1992 (1991). Advances in Coleopterology; Barcelona, European Association of Coleopterology; 323 pp. Tropical Zoology, 6: 451. BARTOLOZZI L., BOMANS H.E. & ONORE G. 1992. Contributo alla conoscenza dei Lucanidae dell'Ecuador (Insecta, Coleoptera). Frustula entomolol., 14 : 143-246. ABBAZZI P., BARTOLOZZI L. & OSELLA G. 1992. Una nuova specie di Troglorhynchus Schmidt, 1854 del Parco Naturale della Maremma (Coleoptera, Curculionidae). Boll. Soc. ent. ital., 124(1): 37-42. BOMANS H.E. & BARTOLOZZI L. 1991. Nigidius inouei, nouvelle espece de Lucanidae de Thailande (Coleoptera). Bull. Sciences Nat., 72: 7-8. BOMANS H.E. & BARTOLOZZI L. 1991. Nigidius cartereti, nouvelle espece de Lucanidae (Coleoptera) du Zaire. Bull. Sciences Nat., 72: 5-6. BARTOLOZZI L. & TAITI S. 1991. Gli Invertebrati del Giardino di Boboli. Boboli '90, Atti del Convegno Internaz., v. 1: 241-252. BARTOLOZZI L. 1991. Osservazioni sulle specie paleartiche del genere Aesalus Fabricius, 1801 (Coleoptera, Lucanidae). Opuscula Zoologica Fluminensia, 76: 1-8. BARTOLOZZI L. 1991. Secondo contributo alla conoscenza dei Brentidae (Insecta, Coleoptera) dell'Africa orientale. Boll. Mus. Reg. St. Nat. Torino, 9(1): 1-31. OSELLA G. & BARTOLOZZI L. 1990. Nuovi Cossoninae (Coleoptera, Curculionidae) d'India e Sri Lanka. Revue suisse Zool., 97(3): 989-1002. BOMANS H.E. & BARTOLOZZI L. 1990. Descrizione di due nuove specie di Chalcodes Westwood (Coleoptera, Lucanidae) di Sulawesi (Indonesia). Rend. Fis. Acc. Lincei, s.9, v.1: 433-439. Macleay de Borneo (Coleoptera, Lucanidae). Bull. Sciences Nat., 63: 27-28. BARTOLOZZI L. & OSELLA G. 1990. Osservazioni sulla distribuzione dei Brentidae (Insecta, Coleoptera) in Somalia. Biogeographia, 14 : 251-263. BARTOLOZZI L. & OSELLA G. 1990. Contribution to the knowledge of Brentidae from Sierra Leone and Ghana (Insecta Coleoptera). Accad. Naz. Lincei, Quaderni, Sez. Missioni ed Esplorazioni, 265: 233-244. PLATIA G. & BARTOLOZZI L. 1989. Contributo alla conoscenza degli Elateridi della Calabria (Coleoptera, Elateridae). Redia, 71 (1): 61-97. LACROIX J.P. & BARTOLOZZI L. 1989. Onorelucanus onorei spec. nov., un nuovo Lucanidae dell'Ecuador (Coleoptera). Opusc. zool. flumin., 45: 1-5. BARTOLOZZI L. & BOMANS H.E. 1989. Onorelucanus aequatorianus n.gen., n.sp. di Lucanidae dell'Ecuador (Insecta Coleoptera). Boll. Soc. ent. ital., 121: 53-58. BARTOLOZZI L., Abbazzi P. & Bambi S. 1989. Contributo alla migliore conoscenza geonemica di Nanophyes (Nanodiscus) transversus Aube (Coleoptera, Curculionidae), con osservazioni ecologiche e morfologiche. Atti Mus. civ. St. Nat. Grosseto 9/10 : 35-39. BARTOLOZZI L. 1989. Descrizione di una nuova sottospecie di Aesalus scarabaeoides (Panzer, 1794) di Basilicata. Boll. Soc. ent. ital., 121(2): 104-107. BARTOLOZZI L. 1989. Taxonomic revue of the genus Penichrolucanus Deyrolle 1863 (Coleoptera Lucanidae) with notes on its biology. Tropical Zoology, 2(1): 37-44. ABBAZZI P., BARTOLOZZI L. & OSELLA G. 1989. Primo contributo alla conoscenza dei Curculionoidea del Parco Nazionale della Calabria (Insecta, Coleoptera). Redia, 72(2): 303-373. Zoologico La Specola dell'Universita degli Studi di Firenze. VI. Arachnida Solifugae e Amblypygi: Tipi. Atti Soc. Tosc. Sc. Nat., Mem. B, 94 : 373-377. BOMANS H.E. & BARTOLOZZI L. 1988. Prosopocoelus ou Prosopocoilus? Note concernant l'ortographe correcte d'un genre de Coleopteres Lucanidae. Nouv. Rev. Ent. (N.S. ), 5(3): 282. Zoologico La Specola dell'Universita degli Studi di Firenze. V. Arachnida Scorpiones: Tipi. Atti Soc. Tosc. Sc. Nat., Mem. B, 94 : 293-298. BARTOLOZZI L. 1988. Brentidi africani del Museo Civico di Storia Naturale di Venezia. Lavori Soc. Ven. Sc. Nat., 13: 101-102. BARTOLOZZI L. 1988. Descrizione di un nuovo Brentide d'Algeria (Coleoptera). Boll. Soc. Ent. ital., 119: 155-158. VANNI S., TAITI S. & BARTOLOZZI L. 1987. Carta Ecologica del Comune di Firenze. Firenze. VANNI S., TAITI S. & BARTOLOZZI L. 1987. Fauna (pp: 58-73)- in: Bianca M. (a cura di), Firenzecologia, Il Ventaglio Ed., Roma. Zoologico La Specola dell'Universita degli Studi di Firenze. IV. Insecta Isoptera e Insecta Hemiptera: Tipi. Atti Soc. Tosc. Sc. Nat., Mem. B, 92 : 241-245. Zoologico La Specola dell'Universita degli Studi di Firenze. II. Insecta Hymenoptera: Tipi. Atti Soc. Tosc. Sc. Nat., Mem. B, 92 : 119-131. Zoologico La Specola dell'Universita degli Studi di Firenze. III. Insecta Dermaptera: Tipi. Atti Soc. Tosc. Sc. Nat., Mem. B, 91 : 191-193. (Insecta Coleoptera). Monitore zool. ital. (N.S.) Suppl. 21: 129-135. BARTOLOZZI L. 1986. Note corologiche e morfologiche sui Lucanidae in Toscana (Coleoptera). Atti Mus. civ. Stor. nat. Grosseto, 7/8: 11-26. BARTOLOZZI L. 1986. Segnalazioni faunistiche italiane, 86-87. Boll. Soc. Ent. ital., 118: 52.
del Museo Zoologico La Specola dell'Universita degli Studi di Firenze. I. Insecta Coleoptera: Tipi. Atti Soc. Tosc. Sc. Nat., Mem. B, 91 : 71-110. (Coleoptera) du Zaire. Monitore zool. ital. (N.S.) Suppl. 19: 299-303. Scapini F. and BARTOLOZZI L. 1983. Orientation of the freshwater riparian Amphipod Orchestia cavimana Heller (Crustacea Amphipoda). Monitore zool. ital. (N.S. ), 17: 295-302.